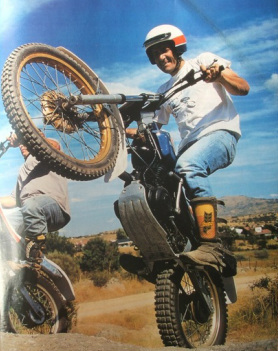 Now that you have some background about Antonio and you appreciate the man, we'll get on to the JJ Cobos trials bike nicknamed the "Spanish Fly". 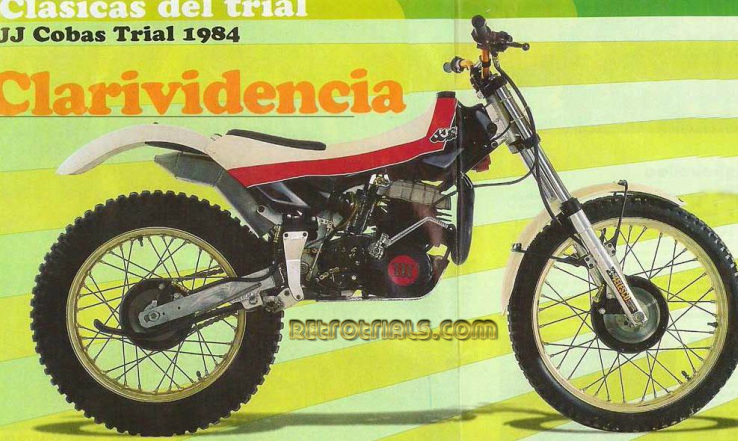 Antonio Cobos designed the machine and was sponsored by local dealer Jacinto "JJ" Moriana - hence the name JJ Cobas.Here was a man with no previous involvement in the trials World. He had designed this bike with a fresh look at trials bike design. He was a clever engineer from outside the feet up world unencumbered by an established ideas of how the bike ought to be. 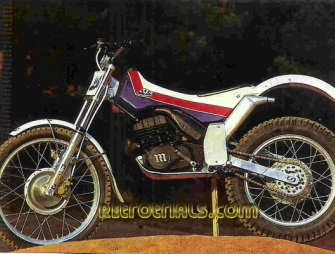 The JJ Cobas trials machine was unveiled in 1984 and contained several remarkable and ingenious features that were thought may well become common place on trials machines.It was initially powered by a Montesa 349 engine , but plans were in place for Montesa to produce a works 330 unit for World rounds. 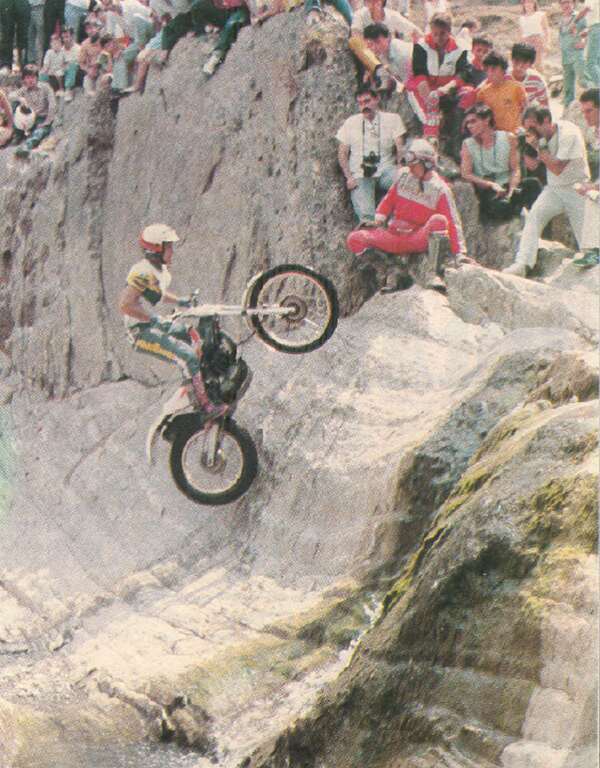 At the time however , Montesa couldnt be relied upon as they were on the verge of disapearing all together. With this in mind Cobas worked with Eduardo Giro designing the bikes own engine.Giro was Ossa's cheif designer and was best known for his innovative 250 monocoque road racer which Santi Herrero so nearly took to a World title in 1969. 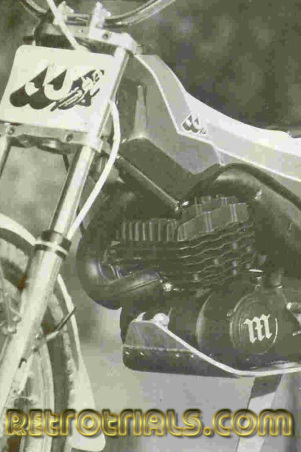 The engine project consumed to much time and money and was abandoned .Bultaco engines were also fitted to some of the bikes as at times Montesa engines were very difficult to source. Giro was breathing on the JJ Cobas engine but the chassis was all Antonio's work. 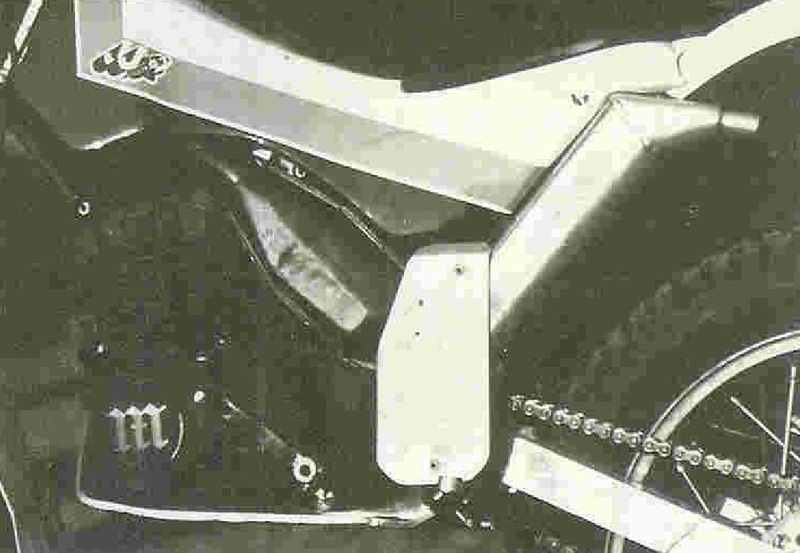 The chassis design was the most remarkable aspect of the bike.The engine was a fully stressed of the chassis. The frame was light weight and great rigidity was achieved through a square section alloy backbone. This was fabricated on the prototypes but was to be a casting on the production run. The fuel was carried in a one piece seat and tank unit which was attached to the frame using one bolt only for quick removal. 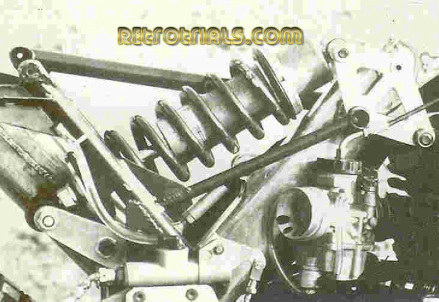 The rear suspension was monoshock with a roling modified "De Carbon" unit worked off a stru forward of the swinging arm spindle. This provided a true rising rate and 185mm of rear suspension movement. This system was similar to that used on Cadus's Kobas 250 road racer. 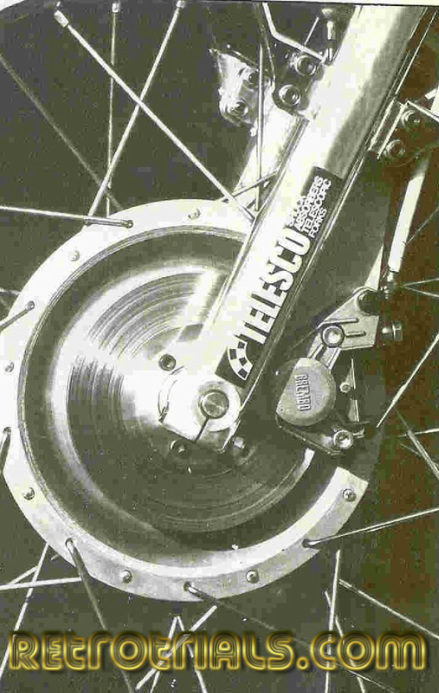 the front forks were made by Telesco who also made forks for Merlin. The steering head angle was adjustable . It could be altered from 24 degrees to 30 degress. 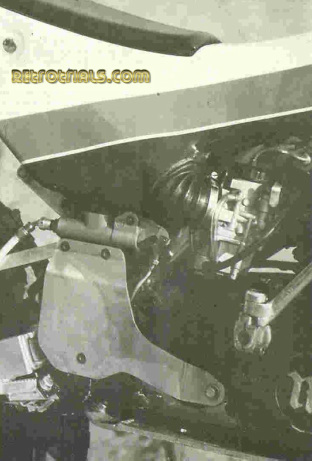 The sup plate was part of the chassis helping to reduce weight ads there was no need for chassis bars to pass under the engine. In order to reduce chain length and stretch Cobas came up with a novel idea.The swinging arm spindle consists of a shaft running in four bearings with a sprocket at either end. A short primary chain connects the gearbox sprocket with onecountershaft sprocket, with the drive chain going from its companion on the other side to the rear wheel. This not only means that constant chain tension is obtained, since the final drive sprocket is coaxial with the pivot point of the swinging arm. It also means that because of the intermediate gearing offered by the countershaft , the sae overall gearing obtained with a conventional layout is achieved with 9 teeth fewer on the JJ Cobas rear wheel sprocket. Another feature is the use of disc brakes at the front and rear. The front disc brake was 160mm and the rear 140mm. The discs were partially shrouded in the Marvic magnesium hubs. 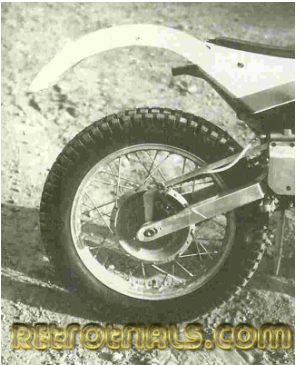 This was very very unusal at the time and it took some persuading to convince the public that the discs would be unaffected by water and mud , if the correct pad choice was selected.Aknront rims were fitted. The bike weighed in at 88kg and was 1260mm in length. Tony Gorgot a former World trials ace at the time was the first rider to mount the bike. 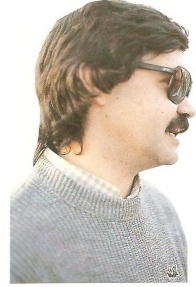 Later Gabino Renales rode the JJ Cobas. Only 10 bikes were produced in the first batch. they were all sold via the sponsor dealer Moriana. The price was £1300. 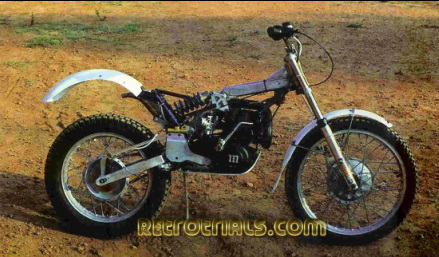 Only 2 or 3 batches - 20-30 were ever made , making this one of the unusual and rarest trials bikes produced. 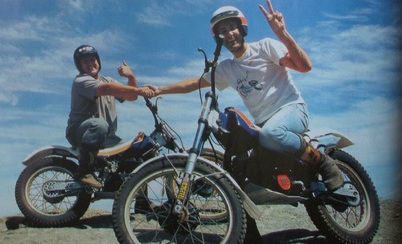 These days you have to be lucky and wealthy to own a JJ Cobas trials bike. They are ridden by enthusiasts not factory riders. Tony Gorgot works at a large motorcycle shop in Barcelona and Gabino Renales is a manager and promotor within FIFA Beach soccer. Its very unusual to see A JJ Cobas , let alone 2. The trials project was just a moment in time for Cobas.It was just one of his projects. He enjoyed designing and making bikes better. It is very unlikely he ever expected or even wanted his life to be taken up with trials. His heart was in the world of GP racing. Its likely that even if the production of these bikes had continued Cobas would have stepped back and played little part in the sport. 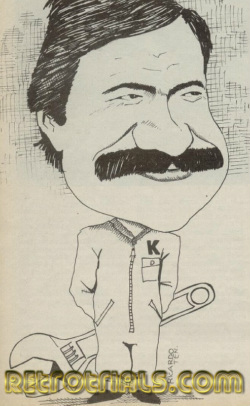 He was a designer and a constructor of bikes.